This past Saturday night at Bellator 214, Ryan Bader needed only 35 seconds to knock out the legend Fedor Emelianenko and win the Bellator World Heavyweight Grand Prix. 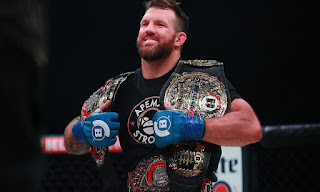 In the process Bader also became Bellator's new heavyweight champion, as he was awarded the vacant title for winning the tournament. That's in addition to his Bellator light heavyweight championship. Bader is now Bellator's version of Daniel Cormier -- the "Champ-Champ" -- and the only one in the history of the promotion. When asked at the post-fight press conference about the next fight for Bader, Bellator President Scott Coker said the promotion hasn't decided, only that Bellator would let Bader move between the two weight classes as long as he doesn't hold them up. That's different than what the UFC did, when they forced McGregor to vacate his featherweight title when he beat Eddie Alvarez and won the lightweight belt, and also for Cormier, who was forced to give up the light heavyweight belt when Jon Jones returned. Bader, it seems, will be afforded the rare opportunity to defend his belts in two different weight classes, provided of course that's what he wants to do. First things first, though. Bellator's contract with Bader is up, so he'll have to sign a new contract with the promotion. Normally it would be interesting to see what his free agency would be like, but Coker mentioned Bellator had a champion's clause in Bader's current deal, making the odds of him leaving the promotion slim. The UFC let go of Bader before, and it's unlikely the promotion would be interested in him now. 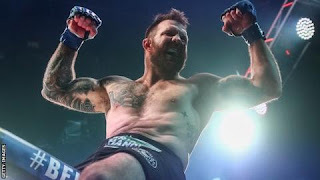 He is most likely going to re-sign with Bellator for huge money, and he'll likely be very happy in his role as arguably the new face of the promotion. The decision of whether Bader's next fight will be at heavyweight or light heavyweight is up to him, but there will be big fights available for him in both weight classes. If he wants to stay at heavyweight -- which I believe is the right move, as he looks incredible at this weight class -- then his next opponent will be the winner of the Vitaly Minakov vs. Cheick Kongo rematch. It's likely Minakov wins that fight, and a fight between him and Bader is very intriguing. If Bader goes back to light heavyweight next, he could potentially rematch Tito Ortiz, face Chael Sonnen in a money fight, or take on top contender Vadim Nemkov, who is coming off of a breakthrough win over Phil Davis. All of these fights are good options for Bader, but the choice will be up to him and his agent. 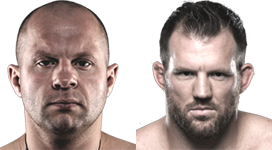 But regardless of who he fights next, Ryan Bader is in a great spot. After falling short of ever fighting for a title in the UFC, Bader is now making more money in Bellator and having way more success. He's turned himself from a gatekeeper in the UFC into arguably the best fighter in Bellator, and now he's winning fights in two different weight classes. He is a terrific fighter, and the UFC is going to regret ever letting him go, as Bellator has been reaping the benefits of Dana White's error for quite some time. Now we will wait and see what Bader and Bellator decide is the next move. But whether it's at 265 lbs or 205 lbs, it's going to be a big fight, as Bader has quickly turned into a must-watch MMA fighter.